In this article, we will guide you How to change browser page title display. 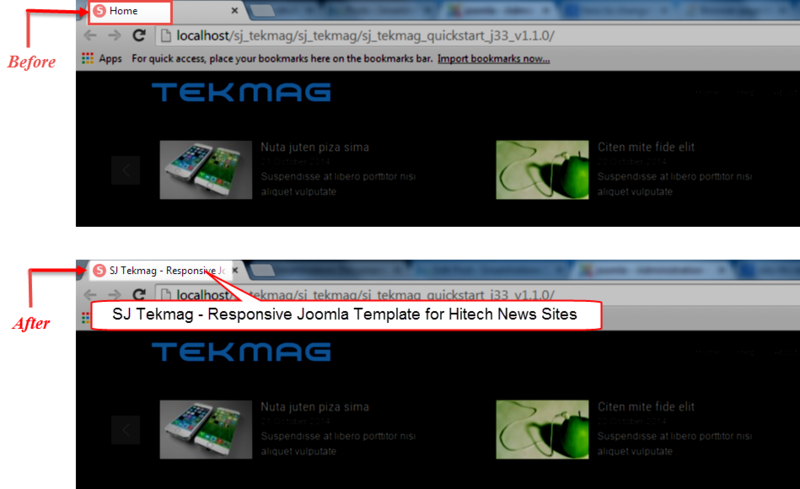 For Example: Change browser page title display in SJ Tekmag Template. Step 1: To change the browser page title for the Home menu item, please go to Administrator Panel >> Menus >> Main menu – English. Step 2: You need to click“Home”. Step 3: You need to click “Page Display parameter” >> Find “Browser Page Title”. Step 4: Enter the title for the selected site page. Step 1: Go to Administrator Panel. Step 2: To click “Home”. Step 3: To click “Page Display parameter”. Step 4: Enter the title. Step 5: Click the “Save”.